During the members Q&A session following the AGM in April, a number of members raised the issue of speeding within the confines of the Hafan and in the Harbour entrance. Your Committee addressed these concerns with the Hafan Manager and the Plas Heli/Sailing Club Events management. The Hafan and Events team were sympathetic and a positive way forward was agreed. We can now report that the following was put in place on 1 June 2015. A safety leaflet has been produced and distributed to Park and Launch companies. Berth holders can obtain a copy from the Hafan office. 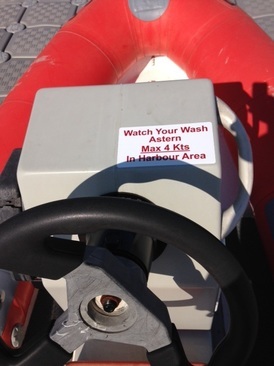 A speed limit sticker has been produced by the Hafan and will be attached to all the PSC event ribs. Copies of the sticker and leaflet are below.